A wildlife trust has one month to save an area of land thought to have been the inspiration behind Kenneth Grahame's book The Wind in the Willows. 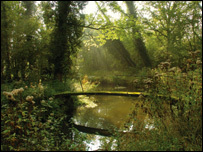 The site, by the Moor Copse Nature Reserve, near Reading, Berkshire, runs along the River Pang, where Grahame is said to have seen the original Ratty. The Berks, Bucks and Oxon Wildlife Trust (BBOWT) has launched an appeal to help raise £235,000 to buy the land. The trust described the site as a "unique wildlife haven". BBOWT said if successful, it would amalgamate the area with the Moor Copse Nature Reserve, doubling the size of the current wetland. The trust said water voles, which are still found in the east of the land up for sale, would be one of the threatened wildlife species to benefit. 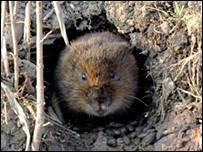 Nigel Phillips, head of reserves at the BBOWT, said: "Our aim is to create new habitats that will allow wildlife, including water voles, to thrive. "The number of meadows and woodland sites in Berkshire has declined dramatically in recent years due to redevelopment. "Protecting this piece of land would not only be wonderful for wildlife, but for people too."